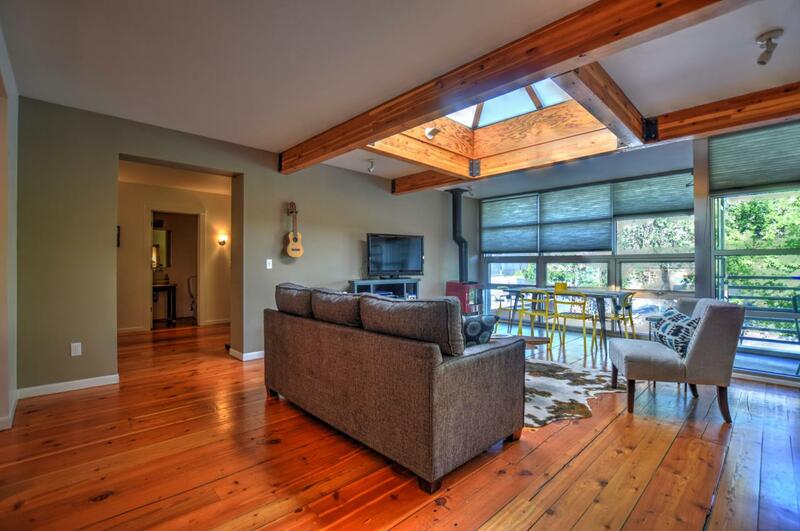 This loft is a hidden gem in an ideal location behind the ''Hip Strip'' of Missoula within walking distance of the University of Montana, Downtown, and one block from the Clark Fork River. The open concept floor plan features reclaimed pine throughout the entire unit (no carpet), an open kitchen with concrete counter tops, floor to ceiling windows and a massive living room sky light for phenomenal natural lighting. Both bedrooms feature an en suite full bath and walk-in closets. Additional features include a half bath for guests, generous office space, Air conditioning, high efficiency furnace, separate laundry room and private patio. The building features an elevator, very large private storage unit and private parking lot. Enjoy the benefits of living close to shopping, restaurants andall Missoula has to offer while relaxing in your private oasis away from the hustle and bustle. As an investment property this property has an excellent vacation rental history with most of the summer booked up. Contact Emily Mackenroth at 406.544.9914 or your real estate professional. Listing provided courtesy of Emily Mackenroth of Berkshire Hathaway Homeservices - Missoula.